Product #3154 | SKU FIREFACEUFX | 0.0 (no ratings yet) Thanks for your rating! 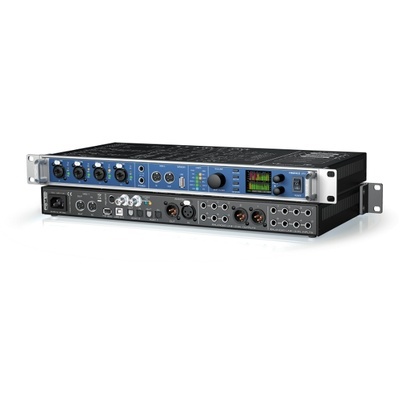 The Fireface UFX from RME is a USB and FireWire audio interface that provides a total of 60 channels of audio, and includes digitally controlled high-end preamps, reference class converters and full 192kHz operation. It delivers ultra-low latency operation, combined with exceptional driver stability. Additionally, the unit includes active jitter suppression, professional reference level support, advanced stand-alone functionality, RME's DIGICheck metering and analysis toolbox, and nearly identical operation and features under both Windows and Mac OS. TotalMix FX is the redesigned and integrated digital high-end mixer and signal router, driven by two powerful DSP processors, with integrated EQ, dynamics and reverb/echo effects, plus built-in monitoring control. The feature set is complemented by extraordinary usability. A bright multi-functional color display with full front panel metering for all 60 channels plus effect bus, delivers complete control of all key features directly from the front of the unit. RME's Fireface flagship interface is a highly integrated pro audio solution, designed for users who don't want to make compromises in sound, stability and ultra-low latency operation.